There were lots of smiles and giggles showing up to take the Success Story pictures at A Chance to Change. Stephanie Craig is the successful OJT individual who came through our GST MI Works! Caro Service Center and she was able to take and complete medical assistant training. After jumping over some hurdles and maneuvering a few speed bumps of life, she landed the opportunity to interview at A Chance to Change in Caro and accepted a position there. She was met with a few more wrinkles to iron out as A Chance to Change requires some non-traditional work hours that can be a challenge. 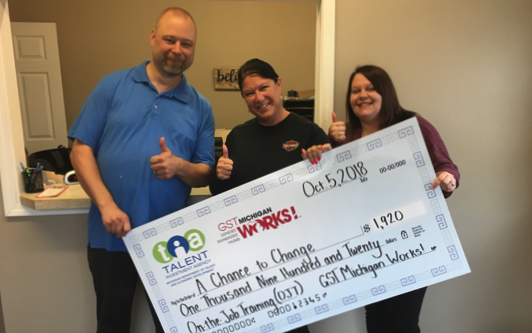 The business partners and Stephanie worked together to find a balance as best they could and with some adjustments for both, it has been a successful employment experience. The banter that goes on in the office is cheery and respectful, they’ve created a light work environment around a serious subject. The statement on their website is: A Chance to Change Drug and Alcohol Testing, LLC is an independently owned testing agency that prides itself on integrity and professionalism. We provide testing programs for Huron County, Tuscola County, and Sanilac County courts. On our way out the door, Co-owner Jamie stated, “Stephanie has been a really good addition to our team; we all get along very well.” And, co-worker Jason chimed in with, “it is really nice to know that she (Stephanie) can handle all the front tasks just fine now. I’m confident things are done right, she is great to work with too!” He did add a chuckle and smiles were on everyone’s face again – those are genuine in the photos!